A brief overview of the natural horn. This article is based on materials from my dissertation. By the end of the eighteenth century two types of natural horns were in general use in Europe, the most common being the orchestral horn. The earliest instruments of this type were seen as early as 1703 but lacked a central tuning slide which was added to the instrument in the 1760s [Fitzpatrick, 32-33, 229]. This design features terminal crooks, which lie between the mouthpiece and the body of the horn, and can be made in various lengths to place the horn into keys as high as C alto and as low as B-flat basso. An example of this type of instrument is shown in figure 1. Figure 1. Orchestral horn, as illustrated in Georges Kastner, Manuel Général de Musique Militaire (Paris: Didot Frères, 1848), plate XIV. The other type of natural horn was known as the Cor Solo. This particular model was introduced by the Paris maker Raoux in 1781, but is derived from the German Inventionshorn, introduced in Dresden in the 1750s [Fitzpatrick, 228, 127]. This type of horn features crooks which are inserted into the middle of the instrument in the manner of tuning slides. These crooks are variously called internal, insert, or sliding crooks, and were normally made to crook the instrument only in the central keys of G, F, E, E-flat, and D. An example of this type of instrument is shown in figure 2. Figure 2. Cor Solo, as illustrated in J. F. Gallay, Méthode pour le Cor (Paris: Schoenberger, [ca. 1845]), 5. The basis of the technique of the natural horn is the harmonic series. These are the pitches that one may sound on an open tube, and are the following. Several of these pitches are out of tune with equal temperament. The worst pitches are the written b-flat', f-sharp'', a-flat'', and b-flat'', all of which tend to be nearly a quarter step flat. Written e', e'', and d'' also tend to be somewhat out of tune, e' and e'' lying slightly flat and d'' slightly sharp. The relative intonation of all of these pitches depends primarily on the construction of the instrument, and can vary widely from theoretical models. Modern brass instruments generally possess better intonation than comparable early instruments due both to their more efficient internal tapers and the avoidance, through the use of valves, of the most out of tune harmonics, which had to be used on the natural horn to obtain a complete scale. Players discovered that by inserting the hand into the bell of the horn they could alter the pitch of the instrument for improved intonation and additional pitches, and that they could also make the tonal color darker and more mellow. This technique was known by hornists in the 1720s at the latest [Hiebert, 122-23]. Dresden hornist Anton Joseph Hampel (ca. 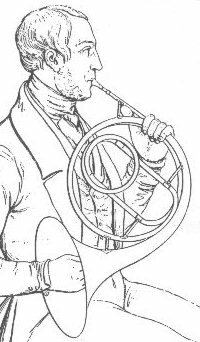 1710-1771) is generally credited with codifying this innovation, on the testimony of his pupil, the horn virtuoso Johann Stich (1746-1803, better known under the Italianized name of Giovanni Punto). By gradually closing the hand in the bell one can lower any sounding pitch one half step with moderate stopping, and any pitch may be lowered to a half step above the next open pitch by combining full stopping and "lipping" the note down. [For an explanation of this phenomena please read the article Understanding Stopped and Muted Horn and Right Hand Position]. This is not the type of hand-stopping used to perform stopped notes on the modern horn; instead of a harsh quality, the stopped notes had only a more covered tonal color. While it was possible to perform a chromatic scale on the natural horn through hand horn technique, composers avoided using an excessive number of covered tones and instead centered horn parts around the open notes out of a concern for projection. In order to use the most open notes composers usually called for horns pitched in either the tonic key of a work or a closely related key. Instead of building a series of horns in many keys, manufacturers quickly designed a system of crooks--additional pieces of tubing which could be added to or subtracted from the horn. Through the use of crooks a given instrument was thus not tied to a fixed pitch level. This possibility of being crooked into many keys gave the horn much more musical flexibility, as the horn could be placed in any key and could function either melodically or as harmonic support. It was quickly noted that there was a great difference of tonal color between the low and the high crooks. For example, a horn crooked in B-flat basso is twice as long as a horn crooked in B-flat alto and produces a somber, very dark tonal color in contrast to the bright and brilliant color of the B-flat alto crook. Composers and performers exploited these contrasts. By the early nineteenth century soloists in particular especially favored the medium crooks of F, E, and E-flat, which were noted for their superior tonal color and playing qualities. [See the related articles, Heinrich Domnich and the Natural Horn and Dauprat on the Tone of the Natural Horn]. UPDATE: See also this video for a brief demonstration of the natural horn and on an E-book on the topic. Horace Fitzpatrick, The Horn and Horn Playing and the Austro-Bohemian Tradition from 1680-1830 (London: Oxford University Press, 1970). 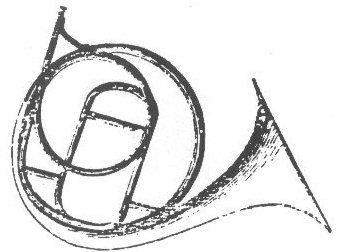 Thomas Hiebert, "Virtuosity, Experimentation, and Innovation in Horn Writing From Early 18th-Century Dresden," Historic Brass Society Journal 4 (1992), 112-139. Thomas Hiebert, "The Horn in the Baroque and Classical Periods," in Trevor Herbert and John Wallace, eds, The Cambridge Companion to Brass Instruments (Cambridge: Cambridge University Press, 1997), 103-114. Richard Seraphinoff, "Nodal Venting on the Baroque Horn: A Study in Non-Historical Performance Practice," The Horn Call 27, no. 1 (November, 1996), 21-24. Copyright John Q Ericson. All rights reserved.